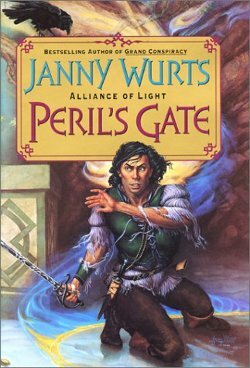 interview Janny Wurts is one of fantasy literature’s greatest living masters. Her first series was the critically acclaimed Cycle of Fire trilogy published in the mid-1980’s, in which the wizard of wind and water, Anskiere, and Ivainson Jaric, heir to the Firelord do battle against the Demon compact of Shadowfane and their allies. The American author followed that up with a collaboration with fellow fantasy master Raymond E. Feist. The fruit of their labor — the Empire Trilogy set on Feist’s world of Kelewan — remains one of the most beloved fantasy series of all time. 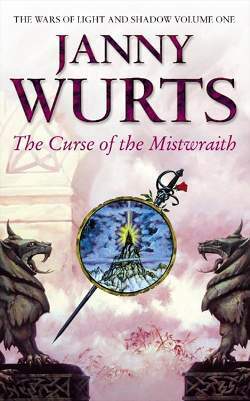 But it wasn’t until Wurts published Curse of the Mistwraith in 1993 that the fantasy world truly realised what this remarkable author had in store. The book was just the first in a massive series — dubbed The Wars of Light and Shadow — that would help to define the fantasy genre, while subverting some of its core ideas. According to Wurts’ website, the seed idea for the series came after watching a documentary on the Battle of Culloden Moor in Britain in 1746. 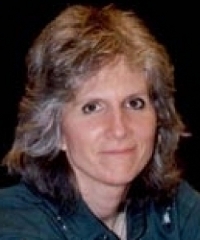 “The experience gave rise to an awakening, which became anger, that so often, our education, literature and entertainment slant history in a manner that equates winners and losers with moral right and wrong, and the prevalent attitude, that killing wars can be seen as justifiable solutions when only one side of the picture is presented,” she writes. In The Wars of Light and Shadow, Wurts portrays both sides of an amazingly complex conflict … and lets the reader decide for themselves about the associated morality. Wurts has also published several stand-alone novels, collections and short stories. But it’s Initiate’s Trial, the next book in The Wars of Light and Shadow, that fans are truly waiting for. We caught up with the author in a recent email interview and got her thoughts on Initiate’s Trial, the construction of the series and the fantasy genre in general. Your series The Wars of Light and Shadow is one of the most critically acclaimed fantasy epics currently ongoing. When do you expect the next book, Initiate’s Trial, to be out, and what can you let slip about the book and the broader Sword of the Canon arc? Though I am extremely hesitant to commit any date – publishers rearrange their schedules all the time, until production begins, and I am just finishing up the last chapters, at this moment – I am hoping to see a publication date in the fall of 2010. Any kind of a concrete preview is extremely hard, because the opening paragraph of the story is going to move all the markers! I don’t want to spoil that impact, one bit, because it is going to leave you breathless. You can expect this: Sword of the Canon will encompass two books packed with unpredictability; a deepening of understanding, both of the characters and the world; reverses that will change your assumptions; a continuation of the stories about the characters you care about; a careful setting of the stage for an unveiling of one of the biggest and best moments in the story at large, and, the setting up for the final volume and Arc V, Song of the Mysteries, which will be one book and deliver the payoff for the entire epic sweep. Some characters will not be what you thought they were, or do what you thought they might. Some ancient conflicts will boil to a head. You’ll encounter one of the mysteries in the map. Some details from Arc I, II, and II will emerge with an importance and weight you may not have foreseen at the outset. There will be some new characters, an unavoidable delight, after the convergence that occurred in Stormed Fortress put a few of the threads into a changed arena. I have a few sneak previews up in the chat at Paravia, for the curious, and expect to post the first chapter as teaser one month before release date. Watch for it. A common complaint of long fantasy epics is that too many plot and character threads tend to overwhelm the author after the first half a dozen books in a series. Yet arguably, The Wars of Light and Shadow doesn’t suffer this problem. How have you tackled this problem of the genre? Planning, for one thing – I’ve worked with this story idea for better than thirty years. Yes, I started very young. Before I published book I, much of the material had been written in crude draft, probably up to Peril’s Gate. I had scenes in piles, and stacks of notes on the back history, and a lot of the future course of the books in fragmentary form. Arc IV’s scene notes ran to over 80 pages. Arc V, close to that. The other angle is the thrust of the books was never designed to sprawl out. I wanted everything “onstage” at Volume I, and from that point, each volume peels off another layer, and shifts the angle of view to deepen the perspective and heighten the viewpoint. I can’t speak for sprawl, because running off in tangential directions and getting lost is just not my way of working. The new, in this series, arises in the revelatory moment, when you are given the fresh angle that rearranges all the markers. What you presumed was not what is actual. What you think at first sight to be a classic pattern gets shattered by one fact, or one scene, that opens up a whole vista – there all along, if you could have perceived, or understood it. I’m eager to bring this massive undertaking to the finish I’ve envisioned at the outset. I’d bore myself cross-eyed to write the same book twice, or dwell in an endless sequence of sequels, or languish in tearoom reunions of favorite characters. There’s not any financial incentive to draw things out, either – instead, the challenge of working a highly individual style and story in a rapidly changing global/corporate market has become a hair-raising endeavor. Fantasy written for a more mature and intelligent readership has posed a labor of love from the outset. The Wars of Light and Shadow is known for its close and detailed focus on several core characters over its span, as opposed to the wider cast and shallower individual focus of other fantasy epics like The Wheel of Time and A Song of Ice and Fire. What challenges and opportunities has this focus given you in the series? Keeping it fresh – not repeating the same plot lines, or doing the same “bar fight” the same old way, again and again – provides me with incentive aplenty to make every single scene break new ground in discovery. That’s my fun, and I trust, where the reader encounters enjoyment, being startled and amazed at the unforeseen twists. More, I hate sequels where the characters have survived the wringer of experience, and emerge with their views or behavior unchanged. Part of what checks any urge to sprawl, or bring on “new” characters, is letting the existing ones grow up. Having ones you already care about fail, and pick up their lives, or change course in the wake of a triumph. Both the social view of the reader, and of the players in the story, are permitted to mature on their strengths, or fall flat on their faults, when the narrative opens them up to their weaknesses. I have never felt the need for new landscapes, or people, when the core of the epic is in unveiling the mysteries in the existing material. Often character development in the Wars of Light and Shadow is startling, particularly as people gain new levels of self-knowledge. To what extent do you feel that authors need to have gone through similar progressions personally to be able to portray them successfully in their work? And what philosophies have spurred your focus on self-knowledge? Life changes perspective – part of what moves the narrative is making it “current” with my own questions about life, and pursuing my own bent of fascination. The story we would read at twenty has a very different impact, viewed at forty or fifty. Over and over again, I’ve striven to create something “epic” – where a shift in view remakes the whole. Whether you move your markers through greater understanding, more experience, or greater wisdom, this tale will provide a different contour, no less compelling. I distrust the idea that there is any “one” way to view anything. The universe we live in bears this out. Every single bit of it is always in dynamic motion. To freeze frame a moment, or define an idea by rigidity, is to rob all the mystery from it, and deny growth, creativity, and evolution. If there is a purposeful truth, I think it might lie in the concept that “ideologies” are false. Systemised thinking falls short because they strive to eliminate anything that is not yet understood. And quite often, under that elusive something, is the next concept that will shatter the model. The moment I feel comfortable with an inspired belief, something in me just drives to bust the boundaries and explore whatever lies over the horizon. If I’ve done my job, the Light and Shadow series accomplishes the same thing. Often your characters are inscrutable to those around them (and even to the reader), especially Arithon and Davien. What are your thoughts about the potential this creates for plot development, especially as it relates to the tension between reader knowledge and character knowledge? If the character is inscrutable, it is because the viewpoint presenting the opinion of them is a blindered one. We form opinions every day, based on a journalist’s words, or a teacher, a parent, a peer. Something conditioned us to hold an assumption. Assumptions can be proven false, very easily, if one acquires from other sources, or breaks the mold of history as penned by the victor. People bring their assumptions to bear, when they interpret what’s said of a character. The prologue of the book warns that good and evil are a matter of perspective. Since I encounter the opinions caused by polarized ideas, every day of my life, it’s not hard to see where presumption will trip us up. I’ve tried persistently to open the pitfall that happens, when human beings close their mind to the existence of alternate angles of view. The revelation that happens, when we find we are wrong, can revise logic, and radically open new avenues of thought. The best stories do that – they lend an experience that reshapes us in some profound way. In such a large series, how have you managed to balance the need for characters to drive the story with the necessity of constructing the wider plot in which they act, presumably several books in advance? The logical progression of a plot does not happen linearly. You know your starting premise, and you pick a finish point, and project toward that. Then you must let creativity inspire the leap. You encounter the way, as you get there. Then, as you move creatively through the progression, you use logic to target the “holes” – anything that would not work, could not work, might be too pat, or crumple on close inspection – you plug those holes systematically until the marble of character, with this set of traits, has to roll in a given direction. Sometimes that marble’s ideosynchrasies jink the plot line this way or that. Sometimes the characters put a downright kink in your best laid plans. You work that in, no question, because it is that lively unpredictable wisecrack bit to their nature that makes the work breathe. Much of life’s problem solving works the same way. When mankind put a man on the moon, it was considered an impossible goal – but with that goal kept in relentless focus, the insoluble problems of engineering inspired creative solutions. It is creativity that brings the story to focus, and no amount of hammering logic, or planning, can replace that as the driving engine. The continuation of the Dune and Wheel of Time series after the death of their creators has divided fans and created intense debate in the literary world. Without wanting to sound macabre, what would you wish to happen to The Wars of Light and Shadow in the event that you passed before it was finished? I’d definitely want the readers to know the outcome I’ve planned, from the start. No way do I want to create this massive tale, and leave it unfinished. I have plenty of outlined notes to say where it is going to arrive. But honestly, from experience, I can also say, no substitute could finish it off in the same way I would. Were anything unforseen to occur, I would hope there would be a way to see the story concluded. It would be arrogant in the extreme, if that happened, to expect such a stand-in (if anyone would, or could) not to blend their own experience in to color the finish. I have known, since nearly the outset, all of the major events and the stepping stone points of major conclusion. No way have I always seen how the characters would accomplish the route to achieve them. More, the elements of my style itself would not be very easy to replicate. Therefore, I intend to be here, at work, and finish the last scenes myself! In a recent podcast interview, you argued that the fantasy genre was marginalised by its image, an opinion that several other writers have also recently expressed, as well as about the stablemate sci-fi genre. Do you think the genre labels are still useful? And what could be done to address this problem? The idea must come first. Exploration of an idea, in outrageous extreme, tells us where NOT to put our feet on the ground – opens new vistas, and new paths – so that coming down to earth can become an enriched, even wiser, experience. I believe, today, that genre labels have already blown the coop. Look at all the fantasy and SF that have “invaded” the mainstream of advertising, books, and entertainment. The very people who scoff at ‘genre’ have already been infected. They just haven’t woken up to the fact, yet. Not everybody wants to be a mover and shaker. That’s fine. But for those who dare to sneer in my face, and belittle either the art of story, or the act of imagination, expect I will have no mercy or patience. Without imagination, there is no compassion – how could you begin to measure what somebody else felt, if you only saw from a hidebound perspective. It is imagination that illuminates the joy and the suffering, and story that passes that gift of experience on to others. The stock answer is simple: I’ve heard from a young oriental woman, in broken English, that the Empire series has become subversive women’s literature in Japan. And I know that certain “think tanks” have hired in SF writers because their engineers had no idea how to project their practical knowledge into ideas, to be created. The closer to “real life” a tale is, the less it pushes the envelope. How do you address the “problem” of prejudice, blind faith, lack of intelligence, and fear of the unknown? Speculative literature is going to push all of those buttons. Not surprising if some folks refuse to look past the sealed box of their comfort zone. For every innovation, there will always be naysayers. The genre label is just the current convenient excuse for dismissal. To what extent do you feel that authors have a responsibility to play a part in discussion about their genre and comment publicly on issues, as opposed to letting their work stand for itself? If story is the gift of experience, given to somebody else, then after the book is done, every reader is going to make that book their own, to love or to hate. I don’t wish to live in a world carved up by rigid ideas of political correctness. This means, in the face of discussion, I have the freedom to agree, or disagree, or to allow by tolerance, and say nothing at all. I’m not terribly fond of stories made into an ideological political platform, since nothing blinds our humanity more than polarized thought. Too often, the guy caught in the middle may be the one who sees the issue most clearly, but who hears him, he’s not the one shouting? A work has to stand for itself, anyway. The author is better off writing another work, than to backtrack to defend it. Fantasy allows discussion of sensitive topics with the gloves off. This is not going to be comfortable. Or defensible. To write at all, and allow the public to share, opens the breach in the first place, since walls are built to eliminate fear. Never to explore fear cancels the opportunity to reach understanding. If responsibility means the ability to respond, education is better than argument. I’d rather open a dialogue with an open mind, than hammer away at an offensively closed one. Although in many ways your work challenges and eclipses traditional fantasy tropes, in other ways it exemplifies them (swords, magic, dragons etc). What is your reaction to the strong challenge posed to such traditional ideas by the wave of so-called ‘urban fantasy’? No, not romance, no, not vampires, no, not Tolkien, no not Paolini, or whatever the going bit is … those things have their place. I have to persist with the belief my own readers will spread word of mouth to like-minded people. Since I’ve never been much of a pack follower, it may not surprise that my work doesn’t trample the beaten path. So I live with it, keep on being an original, and hope the dice fall in my direction. The trend may fade. Truly innovative work will not, because it leads its own curve. I keep going on that premise. Could you describe your writing environment (eg desk, computer, room)? Are you strongly attached to this environment to be able to write, or are you a “have laptop, will travel” writer? Nothing fancy! I work in a made-over one car garage, attached to a house on a country property. The place is spectacular, the room is not. Hot in summer, cold in winter, and too small not to be cluttered due to the volume of stuff that goes on, here. It’s filled with books, a massive stereo, about a thousand cds, and sheet music, and more notes, maps, and paintings and original handicrafts than a junk stall. Oh, and places for cats to sleep, I have four. They have to be in the middle. I write on a Mac cube. I have a little titanium laptop. If I’m most comfortable writing in a good chair, right here, I can work on the road, and have – on buses, airplanes, in the field, and on dining room tables in company (with a headset). Travel is always inspirational. I balance my desk time with painting, sailing, music, riding, and wilderness trips. I play with an active pipe band. I share a big beautiful art studio with Don, when we’re not painting on location outside for amusement. I do have a dream: if a book hits big, I’d like to build a special studio to write and paint in, that would be big enough to hold all the activity. But that’s not essential. Athera and all of the worlds of the stories live in my head. A lot of the early bits were done (and all of Sorcerer’s Legacy) on a tiny portable manual Royal typewriter that I got at a junk stall for 20 bucks. Before I had that, there was paper and pencil. I’ve still got about six spiral bound notebooks filled with the earliest conceptual pieces that started The War of Light and Shadow. Come down to it, the runes and all of the Paravian language were done as doodles in the margin of high school papers. And lastly, a light-hearted question … which do you think twentieth century women would consider the biggest heart-throb if they really existed; Lysaer or Arithon? Well, since I am not a romance writer, really, you’d have to ask the going reader. More, if you are going to frame an opinion, after arc III, but before Arc IV and V finish – you COULD be wrong if you try to speculate. And anyway, isn’t the twentieth century ancient history, at this point? All images used here are copyright to Janny Wurts.